← Blueberry Pickin’ at Snikroc Farm in Durham! 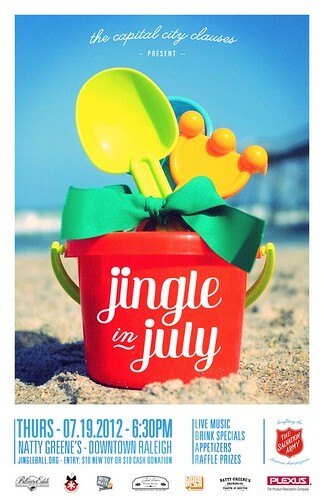 Jingle in July at Natty Greene’s July 19th!! Want to enjoy some live music and donate an unwrapped toy to a great cause? Check out the Jingle in July event this Thursday, July 19th at Natty Greene’s in downtown Raleigh to benefit the Wake County Christmas Cheer Program. For the past 18 years the Capital City Clause’s mission has been to help collect toys for the Wake County Salvation Army’s Christmas Cheer Program. To do this, each year they host the Jingle Ball in downtown Raleigh to collect unwrapped toys. This year’s Jingle Ball is planned for December 6th at Marbles Kids Museum. The Jingle Ball started in 1993 and was originally hosted at the N.C. Museum of History. After moving to Raleigh from Charlotte, Stephen Bryant was inspired to start a charity event to help families in need during the holiday season. He used the event model from Second String Santa based in Charlotte, but instead of Social Services, he approached the Salvation Army as the charity partner because the organization had a delivery mechanism for toy distribution and financial assistance already in place. Bryant pitched the event idea to the Wake County Salvation Army and they agreed to partner with him for one year to see how the event went. After recruiting several friends who worked and lived around downtown Raleigh to join him, Bryant and his team starting planning the event for early December and did the legal work to get the Capital City Clauses set-up as a non-profit. The original Capital City Clauses solicited financial sponsors, as well as food and beverage sponsors, to host the first Jingle Ball. Their goal was to ensure that as many donations as possible generated at the event could go directly to the families in need. The response from the community was overwhelming at the first Jingle Ball- not only did the event generate significant donations for the Salvation Army through toy and cash donations, but it also generated enough seed money for the Capital City Clauses to continue operations between the annual events. “The day after the first Jingle Ball, the Museum of History and the Salvation Army called me asking if they could partner with the Capital City Clauses again the following year,” said Bryant. Since then, the Capital City Clauses have donated tens of thousands of new toys and provided financial support for the Wake County Salvation Army’s Christmas Cheer program. The event has since moved from the N.C. Museum of History to Disco Rodeo to the old Convention Center and finally to Marbles Kids Museum for the past several years.